Canadian Aquaponics - Canada's Source For Aquaponic Information and News: Why Aquaponics? The global demand for fresh water is rapidly increasing and the supply is very limited. Currently, agriculture uses 70% of this scarce resource and food shortages are linked to water scarcity. To avert this crisis, the world needs to produce food in a more sustainable way. Aquaponics uses a mere 10% of the water required by soil based agriculture and less water than hydroponic agriculture. Modern industrialized agriculture wastes large amounts of water by spraying and flooding fields and in the process leaching chemical fertilizers into the groundwater supply. Recirculating aquaponics in contrast loses only small amounts of water to plants and evaporation. The earth looks like it's 75% water, but there's really only a very thin layer. If all the earth's water were gathered together it would look like the blue ball. 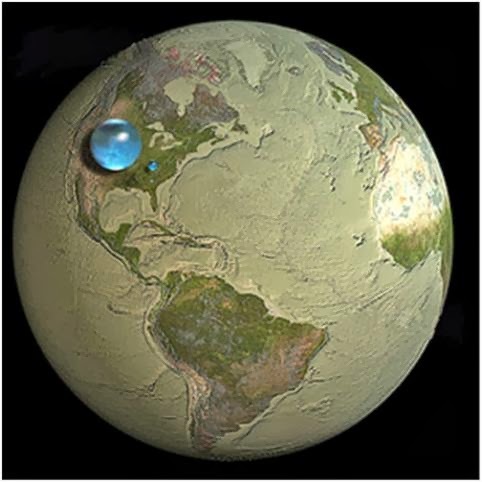 The tiny drop to the right of it represents the critical amount of fresh water that we need to survive. - Credit: Howard Perlmann, USGS; globe illustration by Jack Cook Woods Hole Oceanographic Institution. With over 885 million people not having access to safe drinking water and our groundwater supplies being depleted and polluted, the need to produce food without wasting water is of utmost importance. Scientific evidence is mounting that we are destroying the soil because we over farm. This problem has been masked by the soup of nutrients we use in modern industrialized agriculture, but the truth is there has already been a collapse of the essential soil microbia that holds the ecosystem together. It takes 2000 years to form 10 cm of fertile soil, yet we deplete this top soil in a few years. The good news is that if we let it rest, it will repair itself. Aquaponics is a sustainable soilless way to grow food, so the more food we produce this way, the more we let the soil rest. There are around 7 billion people in the world. That's a lot of mouths to feed and we're increasing at a rapid rate. World food demand will increase by 30% by 2050 based on population alone. Add the growing affluence and changing diets of emerging economies on top of that and you have a huge increase in global food demand. Even with current increases in yields, research shows we won't be able to keep up. We need new ways of tackling the problem and aquaponics is part of the solution. With aquaponics, you can grow food almost anywhere since fertile soil is not a requirement. Aquaponics also produces a much higher yield: growing plants up to twice as fast as soil farming and at much higher densities per square foot of land. Our industrialized food production and distribution systems are huge petroleum consumers. Everything from tractors, irrigation pumps to fertilizer production are heavily reliant on energy. In the US alone agriculture consumes billions of gallons a year. Fertilizer production also consumes a lot of energy in mining potash and synthesizing nitrogen. But the biggest energy consumption (4 times more than the farms use) is for transportation, packaging, marketing, storage and preparation. 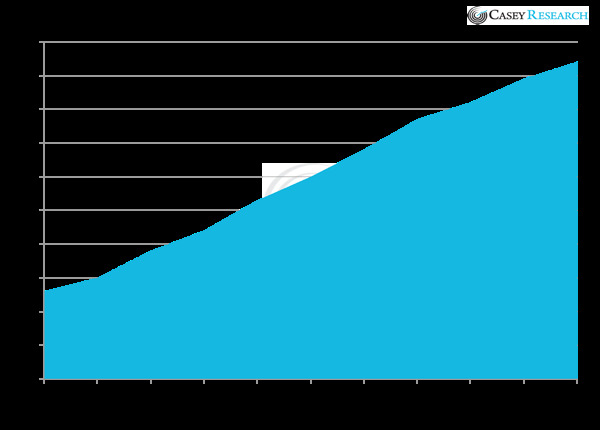 The distance food travels to get to our plates has increased dramatically. Aquaponics can answer this problem because it consumes much less energy than industrialized soil farming and because it makes local food production possible regardless of arable land availability (paved lots and abandoned warehouses are currently being used). A total of almost 80% of the world's fisheries are fully- to over-exploited, depleted, or in a state of collapse. Worldwide about 90% of the stocks of large predatory fish stocks are already gone. Dr. Daniel Pauly, Professor and former Director of the University of British Columbia's Fisheries Centre, gives a short introduction to the problem. Aquaponics is by necessity natural produce. If any chemical or synthetic pesticides, herbicides, or fertilizers are used, the fish could die. Even most approved organic pesticides could kill the fish (an integral and required part of a functioning system). So whenever you eat aquaponically grown food, you're never more sure of it being free of all those toxins. It is also important to combat the two billion dollar industry aimed at selling our children junk food. A recent study published in the Journal of the American Dietetic Association found that kids who are involved in the process of growing their own food are more likely to have healthier diets. The best way to do this in an urban environment is aquaponics. An aquaponic system also provides a great platform to for kids learn about plants, animals, the nitrogen cycle, the water cycle, physics and so much more.